Because underwater acoustics was so important during WWI, the beginning of WWII marked the start of extensive research in underwater acoustics. However, during WWII, progress in underwater acoustics, as in other areas like radar and weapons, was shrouded in secrecy. At the end of WWII, the U.S. National Defense Research Committee published a Summary Technical Report that included four volumes on research discoveries. Still, much of the work done during the war was not published until many years later, if at all. The initial underwater research effort during WWII focused on antisubmarine warfare, motivated by the grim successes of the German U-boats in sinking merchant ships in American waters. Later efforts were devoted to improving the capability of American submarines against the Japanese in the Pacific Ocean. Merchant shipping sunk by U-boats in American waters, January-July 1942. Reproduced from Lasky, 1977, as adapted from the German naval history series The U-boat War in the Atlantic, Vol. 1939-1941. High frequency acoustics: Extensive research was focused on sound at frequencies of a few thousand Hertz or more and ranges of a few thousand meters. These frequencies and ranges were most relevant to the sonars used to locate submarines and mines. Low-frequency, long-range sound propagation: This research would prove to have substantial impact on anti-submarine warfare during the Cold War that followed WWII. Measurements of background noise levels in the sea: Ambient noise levels were measured, because this background noise level affects sonar performance. Diffuse echoes from mid-depths in the ocean were observed on the relatively high-frequency sonars of WWII. In order to understand what might be causing these echoes, a series of experiments were conducted in 1942. A sonar transmitted 24 kHz signals downward in deep water. During daylight, scientists observed echoes from roughly horizontal layers near a depth of about 400 m. With nightfall, the observed echoes indicated that whatever was causing them rose toward the sea surface and spread over a greater depth range. The echoes migrated down again at dawn. The layer was called the “Deep Scattering Layer.” The Deep Scattering Layer was found to be present nearly everywhere in the deep ocean (See foraging behavior related to the scattering layer). It was suspected that the gas-filled swim bladders of fish might be responsible, but biologists towing nets at the depths from which the echoes came did not catch enough fish to scatter as much sound as observed. Following WWII, research showed that the deep scattering layer was made up of small organisms, including fish and jellyfish, with gas-filled swim bladders. It was found that the discrepancy between the number of organisms with swim bladders that were caught and the intensity of the echoes occurred because these organisms were able to avoid the nets towed by the biologists. The Deep Scattering Layer proved important in the later development of acoustical oceanography because it stimulated research on fish swim bladder resonance and more recently on invertebrates, especially some types of shrimp and squid ( Examples of air and cartilaginous structures in squid and cuttlefish that act as reflectors. This research also formed the basis for fish-finding sonars. A recording of a sound in the SOFAR channel. Recorded in 2004 in the north central Pacific Ocean. The source is at 250 Hz and a depth of 750 meters, approximately on the sound channel axis. The receiver was 1000km away at a depth of 693.5 meters. Even before WWII ended, the U.S. Navy experimented with the use of these long-range transmissions as a lifesaving tool. The notion was that survivors of a downed aircraft or sinking ship could drop a small explosive charge set to explode in the ocean sound channel. The arrival times of the signal at a number of widely-spaced, on-shore listening stations could then be used to compute the position of the life raft. The project was called SOFAR (for SOund Fixing and Ranging), giving the SOFAR channel its name. 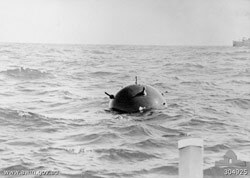 German contact mine placed in Australian waters during World War II. Photo by the Australian War Memorial (http:// www.awm.gov.au). The rapid advancement of underwater acoustics continued after WWII, with wartime developments leading to large-scale investigations of the ocean’s basins. Coupled with advancements in technology (e.g. computers), underwater acoustics has become an important tool for uses such as seismic exploration, weather and climate research, and underwater communication. It has also continued to play a significant role in navigation, shipping and other marine operations. For more information about these practical applications as well as further research and advancements in underwater acoustics, please visit the other sections of the DOSITS website. Bermuda Biological Station for Research: The Great Ocean Migration. NOAA Ocean Explorer: Submarine Signaling. Adams, K. T. (1942). Hydrographic Manual. Washington, D.C.: Government Printing Office. Bell, T. G. (1962). Sonar and Submarine Detection. U.S. Navy Underwater Sound Laboratory Report 545. Bonneycastle, C. (1838). Notes of experiments made August 22–25, 1838 with a view of determining the depth of sea by echo. Proceedings of the American Philosophical Society, 1, 39–41. Clay, C. S., & Medwin, H. (1977). Acoustical Oceanography: Principles and Applications. New York: Wiley. Bass, H. E., & Cavanaugh, W. J. (2004). ASA at 75. Melville, New York: Acoustical Society of America. Hersey, J. B. (1977). A chronicle of man’s use of ocean acoustics. Oceanus, 20, 8–21. Lichte, H. (1919). Uber den einfluss horizontaler temperaturschichtung des seewassers auf die reichweite von unterwasserschallsignalen. Physik. Zeits, 17, 385. Maury, M. F. (1858). The Physical Geography of the Sea, 6th ed. New York, NY: Harper and Brothers. Urick, R. J. (1983). Principles of Underwater Sound, Third Edition (3rd edition, Reprint 2013). New York: McGraw-Hill, Inc.